The Minolta CLE had always intrigued me as a lighter body alternative to my heavier Leica M bodies, like the M3, M6, and M7, while still being compatible with my Leica M-mount lenses all in a compact package about the same size as my Fuji X100T, or 1970s era fixed lens rangefinder compacts like the Olympus 35RC. Minolta no longer services these cameras, and there are not many people who can. I bought mine from one of the few shops that still does, Shimbashi Camera around the Okachimachi area of Tokyo, where they had just overhauled a CLE along with its M-Rokkor 40mm f/2 lens. The price was right and I bought it. Rather than being a diet soda version of a Leica M as I had expected, the Minolta CLE is a full octane camera, brilliant in its own right, and even gives Leica M bodies a run for the money. The finder is beautifully clear with a decent focus patch. There are only three frames, 28mm, 90mm, and the unusual 40mm frame that appears elsewhere only on the Leica CL, presumably upon which the Minolta CLE is based and improved. 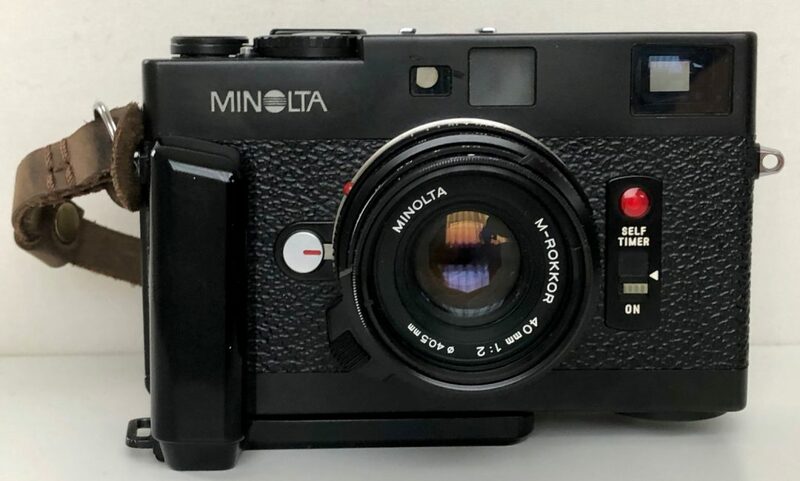 Minolta had manufactured the CL for Leica until Leica abruptly and rudely pulled the plug as buyers began opting for the CL over the unfortunately designed Leica M5. The 28mm frame in the CLE finder is completely viewable in its entirety even with glasses, unlike the 28mm frame in the Leica M .72x finders, in which you cannot view the 28mm frame all at once whether you wear glasses or not. 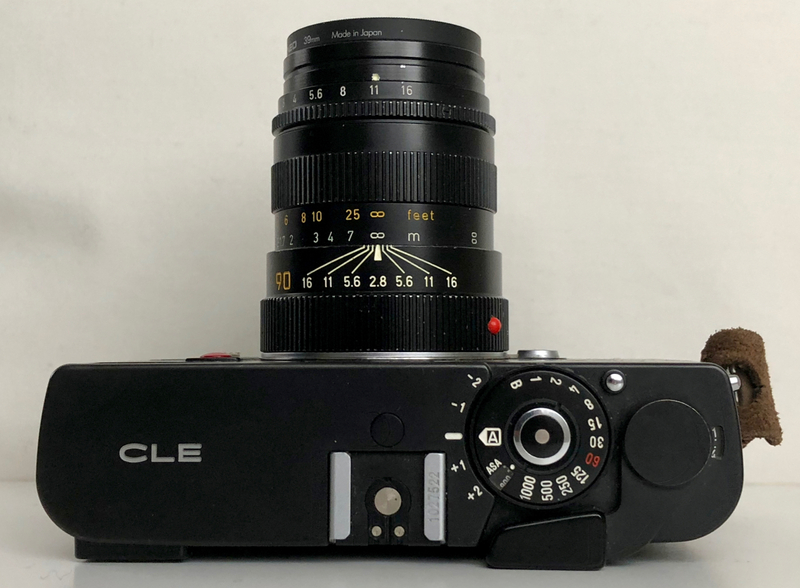 If you like to shoot 28mm, the CLE is a far better option than any standard Leica M.
The base length of the Minolta CLE is shorter that that of the Leica Ms. That is to say the two rangefinder windows used for focusing are closer together. I often hear people say that because the focus cam is different, regular Leica lenses won’t focus properly on the Minolta CLE, but this is only an urban camera legend. I suspect it was invented by Leica marketing people to prevent lenses made for the Leica CL and the Minolta CLE from cannibalizing sales of other Leica lenses, and the same for Leica bodies, as these versions cost substantially less. The shorter base length of the finder windows only means that focus accuracy is more challenging, particularly with a 90mm lens. You might need to get the camera aligned with whatever 90mm lens you might be using–and even then the frame and focus patch is too small and hard to see in my opinion! So what about the lenses? Minolta produced Rokkor lenses for each of the frames sizes. In addition to the 40mm f/2, there are also a 28mm f/2.8 and a 90mm f/4. The Leica CL also had its own range of Leica-C lenses, although the ones sold in Japan were branded as Rokkor, not Leica. So if you happen to find a Rokkor 40mm f/2 that is built to the same specs as the Leica Summicron-C, rest assured it is the same lens, only it was originally sold in the Japan market. In any case, apart from some wide angle models whose rear element may extend too deeply into the interior of the camera and perhaps a collapsible Elmar, any M-mount lens will work perfectly fine on the Minolta CLE. So if you already have any M-mount 28mm, 40mm or 90mm lenses, these will do just fine. If you mount a 50mm lens, the CLE will choose the 40mm frame. I am not sure what happens when mounting a 35mm lens though. If any reader does, perhaps you could post a comment. Forget using any of the made for the M3 Leica 35mm lenses with corrective optics. Because of the shorter base length, the optics won’t align properly with the rangefinder windows. For the 40mm focal length, your options are more limited. Leica produced a Summicron-C 40mm f/2, which is a superb lens, although the build quality is slightly inferior to standard Leica lenses in my opinion. Minolta’s Rokkor 40mm f/2, made for the CLE, is just as good as the Summicron-C in my opinion. I cannot distinguish results between the two. Build quality is about the same. The Summicron-C however is slightly more compact than the Rokkor. The Rokkor takes a standard 40.5 mm lens filter. The Summicron takes a Series V lens filter which has no thread, and requires its own unique hood in order to mount it. For the life of me, scouring eBay, I have never been able to find all of the hood and filter elements for this. This is frustrating, because I tend to always use lens filters rather than leaving the lens element directly exposed to the world. I’d rather scratch a lens filter than a lens element! You can use standard 39mm filters with the Summicron-C 40mm, but the threads, which were presumably designed for the hood attachment, are slightly different. You can get away with screwing in the lens filter gently until its stops, but don’t tighten or you will strip the threads! Voigtlander also currently sells several 40mm M-mount options, although I have no idea of their quality. If you have experience with these lenses, perhaps you can post a comment. So is it crazy to purchase a 40mm lens just for use on the Minolta CLE? In my opinion, no. 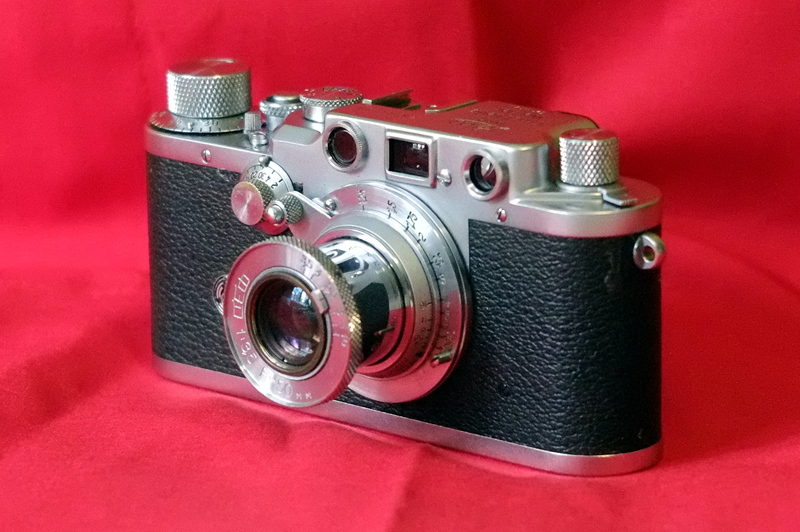 The CLE like the Leica CL, was designed for the 40mm focal length, which is the same or about the same used on many a brilliant cameras including the Contax T2 and most of the fixed lens rangefinders of the 1960s and 1970s made by Olympus, Minolta, Ricoh and others. 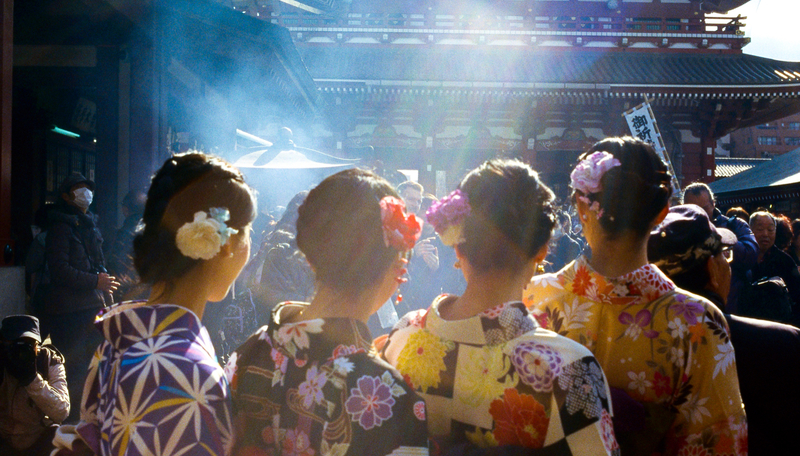 You can use the 40mm lens on Leica M cameras, but they call up the 50mm frame. In my experience wearing glasses, the 40mm frame corresponds almost exactly to the entire viewable area of a .72x finder. With the Minolta CLE, I shoot mostly with a Leica Elmarit-M 28mm f/2 ASPH. and a Leica Summicron-C 40mm f/2. These are the most compact, lightest Leica M-mount lenses ever made. So if you are traveling, the CLE body and these two lenses are the most Zen of M-mount kits. Occasionally, I will shoot with the tiny yet superb Voiglander 21mm f/4 with an external finder. I find the Minolta CLE is ideal for this lens. Also, I have from time-to-time just for fun, attached my Leitz LTM Hektor 2.8cm f/6.3 pancake lens with an adapter. I’ve shot with my 90mm Tele-Elmarit, but I really don’t recommend shooting with a 90mm lens on the Minolta CLE if you have Leica M body option. The focus patch is just too small for 90mm, as is the frame. 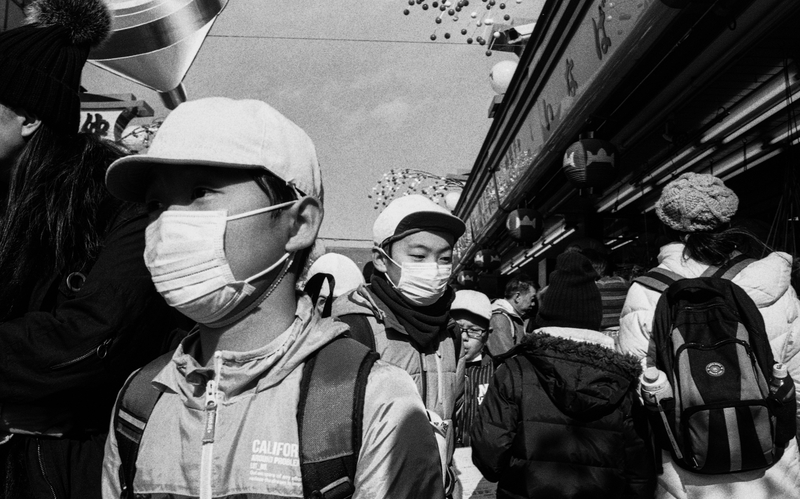 As a street photography camera, the Minolta CLE is hard to beat. The camera is so compact, I can slip my CLE with the 40mm Summicron into a jacket pocket pretty comfortably. The CLE feels good in the hand, and is incredibly light. In some respects, it is almost too light. You need to pay attention to camera shake. Apart from a few gaudy, overpriced special editions, the CLE is black and discrete. The Minolta CLE has an electronic shutter and an automatic exposure mode. Shutter speeds appear to the left of the finder frame, with red LED lights illuminating next to the appropriate speed, far niftier than say the primitive LED number display in the Leica M7 finder. The shutter release button is smooth and rounded, and has touch sensitivity. Just lightly brushing your finger across it activates the light meter, a spiffy feature nowhere to be found on any Leica. Unfortunately there is no AE lock, which I find I kind of miss. If you want to lock the shutter speed, you have to set it manually. There is a dial on the top plate for doing this, which is easily rotatable. However, there is a little silver button by the dial that must be depressed to unlock the dial from AE mode. It took me a while before I realized that could be easily done with one finger in one motion when adjusting. Unfortunately, shutter speeds are not indicated in the finder when shooting manually, but this is no big deal. It’s just like shooting a Leica M3. The Minolta CLE for all its wonderful attributes is no Leica M. It leans a tad plasticky. The CLE both sounds and feels like plastic. The shutter release sound is not a smooth whisper like a Leica M. Rather, the camera makes a cheap clackety-clack sound that comes off as dissonant given the superb finder, spiffy touch sensitive shutter release button, and nifty illuminating LEDs in the frame. The body seems solid enough, but the film advance lever and the shutter speed dial are plastic. 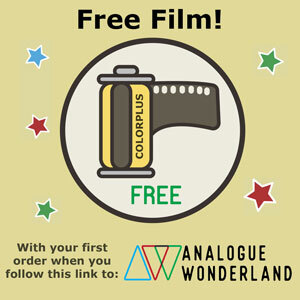 The film rewinder is by crank, but on the bottom of the camera. The Leica Ms all rewind clockwise. The Minolta CLE rewinds counter-clockwise, so pay attention! To open the back of the camera after rewinding, just pull out the rewinder a notch, give it a half rotation same direction as rewinding, and the hinged back door will unlock and pop open, opening to the side. No detachable bottom plate like on all the Leica M bodies! Film loading is a breeze, and I consistently get at least thirty-eight or even thirty-nine exposures on a roll of film depending on the brand. 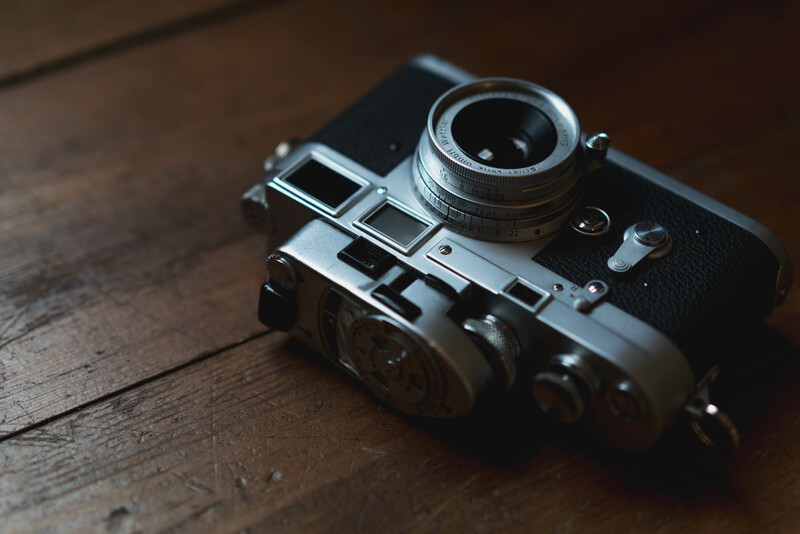 Is the Minolta CLE worth owning? Yes. It is a superb M-mount camera in its own right for sure, but what about as an alternative to a Leica M? Well, perhaps. It all depends on your preferences and priorities—and of course on your budget! You can usually get a Minolta CLE with a Rokkor lens together for less than the cost of a Leica M3 body, only that the M3 will still need an overhaul when you buy it! If you own a Leica M is the CLE worth getting? Maybe. It allows you to use your 28mm, and 90mm M-mount lenses natively, and you get a frame for the distinct 40mm M-mount lenses. 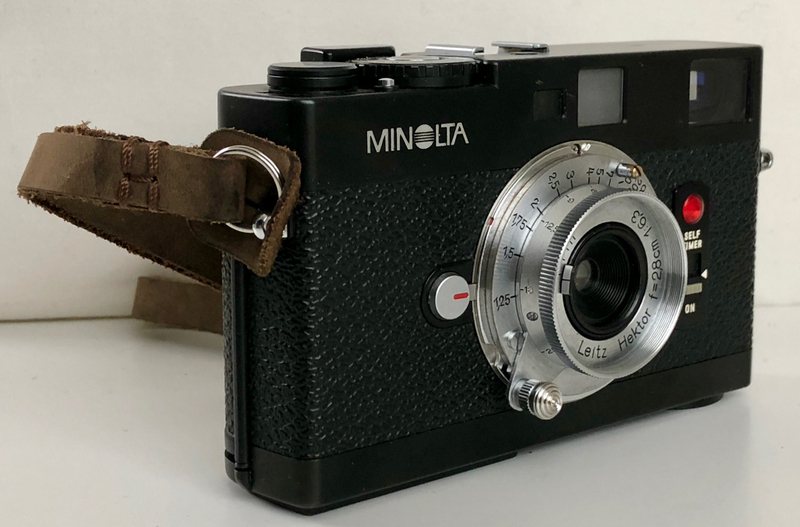 A Minolta CLE enables you to pack an M-mount kit that is lighter and more compact than any Leica M. If that appeals to you, go out and get a Minolta CLE, the most Zen of all M-mount cameras. You won’t be disappointed. I totally agree! I am the lucky owner of a Leica CL (which is very similar) with the 40mm summicron, and to be honest I like it better for travel and fast snapshots. I do have M6 as well, but in a way prefer the CL in handling and it’s (in my opinion) perfect 40mm framelines. I love the 40mm perspective, little less compressed than 50mm and not so wide that it would give clutter in your compositions. Using a 35mm lens brings up the 28mm frames lines. Or so I’m told. Great write up! 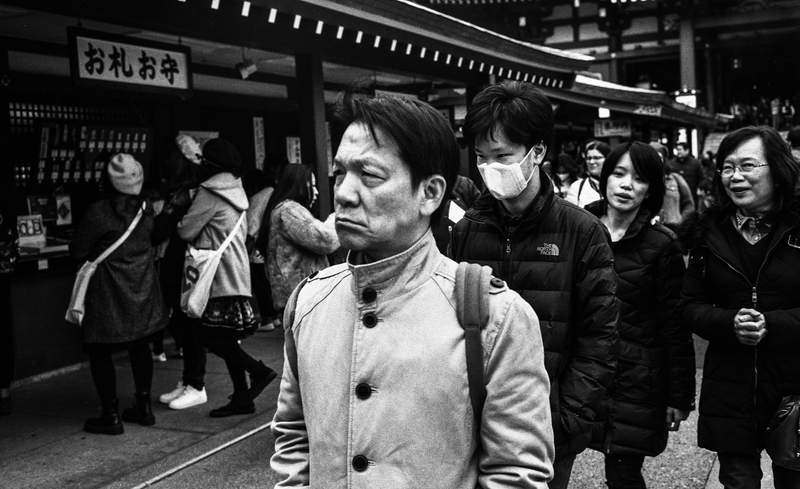 I have the Leica 40mm, which I use on an M3, and feel the same as you do about always wanting a filter on the front. Sm-camera sell an E39 adapter that’s on its way from China as we speak – I’m hoping this will improve on the ‘half screen in and hope for the best’ method, and deals with the one major downside of this tiny lens. Works perfectly and puts an end to the worry that this lens isn’t quite perfect! 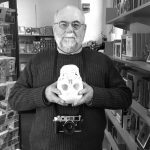 A Great piece on a great camera Steven- I sold my M7 and bought a CLE to feed my M- Mount lenses onto, and I don’t regret it one bit. My main go-to lens is the Voigtlander 40mm 1.4 Nokton and I can confirm that it’s a stunning lens- great for street and portraits. My main fear is that one day I will go to use my CLE and it won’t work, and it won’t be repairable. Best not to linger on that and enjoy it while it lasts! Good to know about the Voigtlander Nokton. Thanks! Nice wrap-up and pictures! As to the question whether one shall buy it already having an M, that’s of course personal choice, but I can share my experience. I had an M4p already, but felt that sometimes I’d have something rather smaller, and with AE for quick snaps, so I got a CLE. Got one for a nice price with 40 and 28 rokkors to boot. Tried to like it, but that never worked out, so I sold body and 40mm keeping the 28. The thing is it’s not that much smaller than M, but viewfinder and build overal are so much modest 🙂 VF is night and day really (both brightness and magnification). I also learned to meter by eye, so that’s not big problem anymore. I think the experience shooting the CLE is different from shooting with an M. How much that difference matters is really up to the user. In my view, the CLE does not replace a Leica M. However, if you like the ergonomics of the 40mm fixed lens rangefinders of the 1970s, but want a camera that is higher quality, more substantial, and gives you interchangeable lens options, the CLE is the way to go. Thanks for the review. You’re producing some nice work with your version of this camera. I had a Leica CL. It was an early production model, so it had it’s share of bugs. It went out for repair a couple of times, but I just lost confidence in it – wondering when the next thing would go wrong. It went in as a trade for a Leitz-Minolta CL. These versions had all the early production bugs worked out, and essentially were sold to the domestic market in Japan. My version was bought by a US serviceman and brought back to the US. It’s a gem with a working exposure meter! I have it coupled with the equally fine M-Rokkor 40mm f/2.0. These lens works well on my M2 & M4-P. I’ve shot with my 50mm Planar (M) on the CL with great results. I carry the CL as my everyday, ‘walk-about’ camera. Compact, light but not flimsily, easily slipped into a pocket. Loaded with 400 speed, B&W film, it’s my version of an artist’s mall sketch book. When we travel, it’s my second back-up camera. Good to know about the distinction of the Leitz-Minolta version. I am in the slightly different halfway house position of having a Leitz CL, which is the original version developed by Leitz and I believe, built by Minolta, this camera does not have the frame-lines for a 28mm lens, even though it does have them for 50mm. I do have the phantom Leitz 40mm Summicron with its rubber hood and a skylight filter as mentioned above, though so far I have failed to find a yellow or yellow/green filter for black and white. Other differences are that the camera is basically manual, with an M5 style spot meter mounted on a little wavy arm that swings into position between the lens and the shutter for composition, and then swings out of the way for taking. I am given to understand that many of these do not work any longer, mine works fine, however the camera is not exactly pristine, and the meter is a bit “off”. I am not sure whether this is because it has been adjusted to take modern batteries and I am using the voltage converter… or whether it is just old. Either way, the real benefit of the CL over the CLE is that when these things do eventually break, the CL is still a usable manual camera. The CLE has a number of benefits over the CL too, so as in everything it is horses for courses. As you say, the CLE has automatic aperture priority, whereas when working, the CL is effectively a manual aperture priority camera. You decide on your aperture and then adjust the shutter speed manually until you get the desired speed. It is of course, no accident that many of those compact cameras from the 60’s and 70’s used 40mm lenses along with the Minolta/Leitz offerings, apparently that length is closest to what we peeps see when we just use our eyes… It represents the most normal of normal lenses. I have an LTM Leica iii and an M4, and I like them all, as well as my digital Leica CL, but that 40mm lens does mean that I often find myself wandering around with this little oddity more often than not. 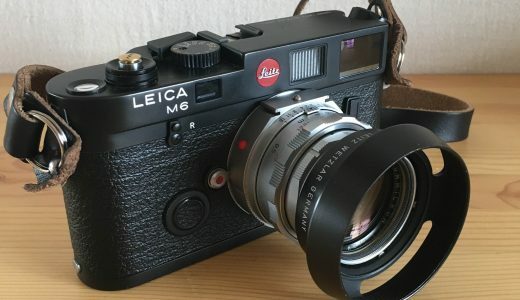 It’s a pity that Leica took such a dismissive view of it when they believed that it was interfering with their M5 sales. The reality is that despite its similarities to the CL, the M5 is not a nice camera to handle, and I would say that it was the M5 that was at fault, not the CL/CLE, or the customers for buying them. Despite their little quirks and the danger that the Minoltas will eventually pack up altogether, they are truly the essence of M style photography… As you say…. the Zen M.
I agree with you observation, that in many ways the CL/CLE are both more faithful to the idea of portability than the Leica M cameras. Leica might have done well by making higher-end CLs in Germany or elsewhere rather than cutting the line entirely. Today, Leica has re-introduced a German-made digital compact CL and it also has the Q, and I believe both of these have been very successful, particularly the Q. The Panasonic-made Leica’s are unlikely to cannibalize M sales today, nor will the Q or the CL, and perhaps the key difference is that none of them take M-Mount lenses like the original Leica CL did. As for the M5, I think it is a fine camera, and distinct among the Ms, but today is a different time. The priorities and interests of M shooters are different from what they were in the 1970s. Let me and others know about the adapter by posting a comment here. Some years back, I bought such an adapter off eBay that had a major design flaw and did not work. I cannot recall if the seller was sm-camera, and the purchase is no longer in my eBay history. The problem with the adapter is that it screws in flush against the aperture ring, and would cause friction against it. Screw it in tight, and you cannot move the aperture ring. Keep it loose, and it rotates with the aperture ring. The adapter arrived last night, and fits perfectly, see here: https://www.dropbox.com/s/uu7wsu14sq11ydn/sumicron-c.JPG?dl=0 The aperture ring isn’t affected, so seems like this might be the solution. ‘Adapter Leica E39 to Summicron-C 40/2 -39mm (S5.5) f/2.0 Lens camera’ from sm-camera. Great! This is really good to know! Thanks! The Elmarit 90mm lenses may be a bit difficult, but on my CLE I routinely use a 90/4 M Rokkor lens (40.5mm filter) that was released at the same time as the original Leitz Minolta CL. No problems with focus or framing at all. As a couple of people pointed out, the only thing the CL and the CLE share is a lens mount. Every other system is different and nothing else is interchangeable. I also enjoy a Voigtlander 28/f3.5 with a Voigtlander 28/90 screw mount adapter. It’s an easy camera to handle and I use it alongside an M4-P with no problems going back and forth. Great little film camera allied with the Leica 28mm lens. I found that while the Leica and Rokkor lenses were similarly sharp, Leica had a more pleasing (in my eyes) hue, warmer, than the steely blue of the Rokkors, if shooting colour. The stand out feature of the CLE for me however was the TTL flash capability which obviously couldn’t be matched by Leica until they brought out a TTL M6 if I recall. Bear in mind that the most beautiful photographs you have seen hanging on the walls of the world’s best museums were shot with lenses inferior the one you have in your iPhone. No one ever looks at an Elliot Erwitt photo and exclaims, “Wow, that’s amazingly sharp!” Sure, the quality of the Leica lenses is somewhat better, particularly some the newer ones, but we are really splitting hairs here. Most people probably would not notice the difference, and I am not sure I would either unless I were really looking hard. I got the CLE before getting my M2 (was surprised how heavy the M2 was to the CLE) When i’m traveling I find myself bringing the CLE because I have a flash for it and with the meter it just feels more versatile. yes I know I could get the M6..but that’s 3 times the cost. I take my M2 out more locally during the day, though and sunny sixteen it. I have the voigtlander 40mm f1.4. The biggest issue was the aperture ring will come loose and you will need to get it fix. I’m looking at getting a 28mm for my CLE. I feel that that’s the focal length it was meant for (I use a 35mm to bring up the 28mm to shoot around). I think you are right about the 28mm. The CLE is perfect for that focal length, much better than my M7! Elliott Erwitt used a Leica M3 & a 50mm Summicron. Tri-X. Good shoes, unique view of the word and a great sense of timing. Yes, and listed in ascending importance! I have own this camera and I ve found it nice despite some electronic issues. 40mm is a wonderful focale. I ve own two Rollei 35 RF and this is a great camera despite there is no wide angle and only 80 mm framelines. 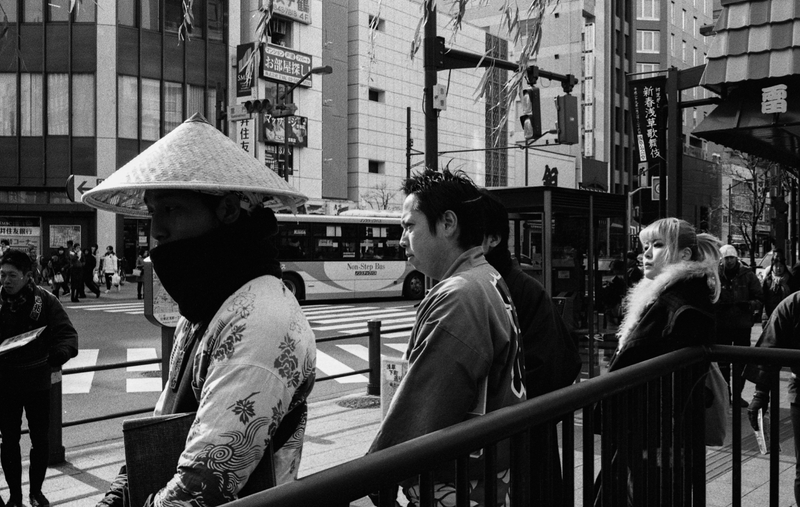 The Sonnar 40mm for Rollei does not add any special things. The meter is fantastic. Now I use 40mm with M3, the Summicron-c, the Voigtlander Nokton 1’4 and the Rokkor. The Summicron C is a winner coz is sharp and compact, the last Rokkor are more pop effect where the Summicron is more velvet silk touch and the Nokton is very sharp but sweeter and more pastel. On a Sony A7 R2 these 3 lenses produce different effects especially for the Bokeh the Nokton is better. At the end when I want to travel lighter I have my 2 options. The Minolta Hi-Matic 7Sii with is crazy sharp Rokkor certainly the best Fixed lense rangefinder of the 70’s with the Canonet, and my second option is my lovely Contax T which was one of last camera of HCB. This Contax T is a marvelous camera. My problem with the CLE is electronic, it will finish as a paper weight, the Minolta Hi-Matic is playable to repair, the Contax T is more difficult to fix, the M3 is easy to repair. 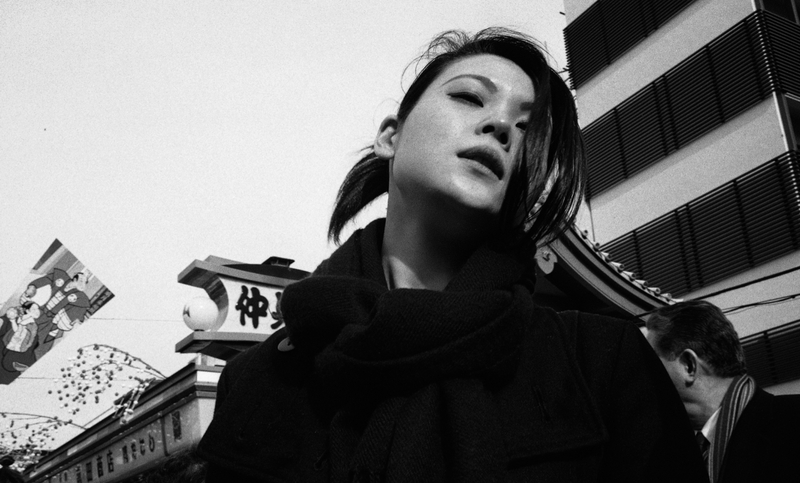 I like the Summicron C because it is easy to sale for a good price as all Leica lenses. The Rokkor 40 mm delivers great images. For 90 I use also the Tele_Elmarit from Canada and despite is flare issues it is so sharp and contrasted, little soft on corner at 2’8 but at 5’6 no difference with other new brand Leica, is special advantage is compactness, one of the smaller 90 mm with 2’8 aperture and Leica Signature. !!! You want a great 40 mm carrier choose a Leica CL for little size or a Rollei 35 RF ! Photos are wonderful ! 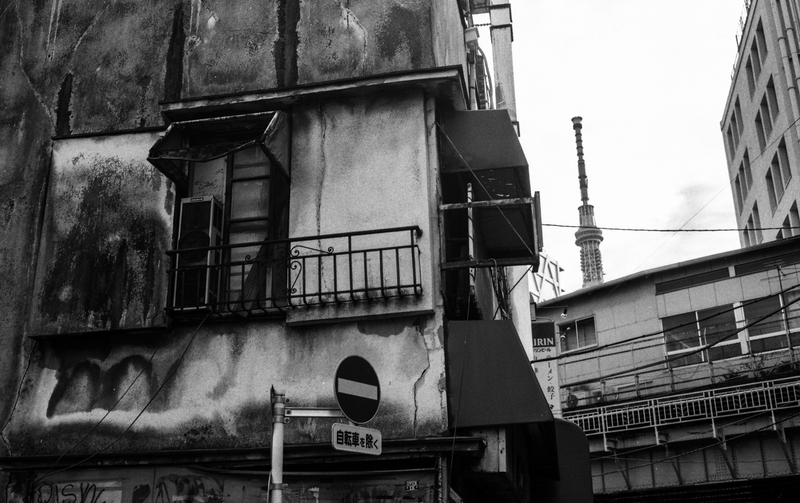 It remembers my walks on Tokyo looking for special cameras. Thanks for sharing your experience with such a wide range of similar cameras and lenses. Glad you like the photos! 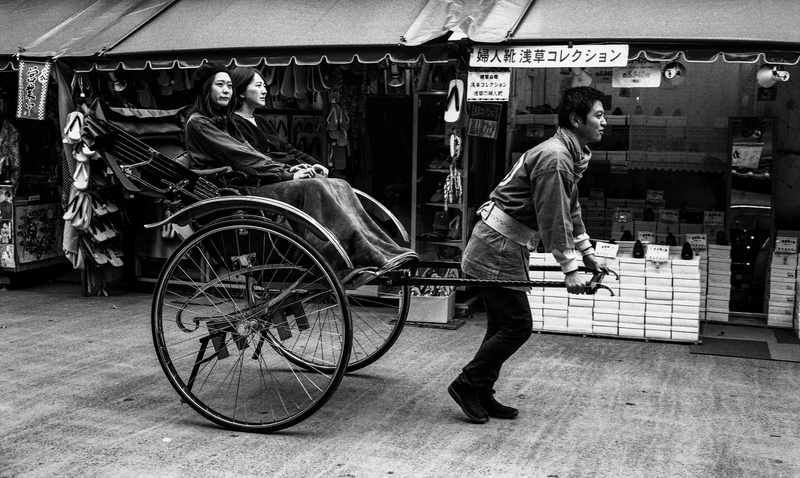 I agree with you about the Summicron-C. It is a wonderful little lens. The M-mount can set three focal length settings via variations in the length of the bayonet lug opposite the release button. As standard, Leica sets three pairs of framelines (where available), 28+90, 35+135, and 50+75. The CL makes no use of the 35+135 pair and the 40mm lenses use the 50mm setting. Minolta took advantage(?) of the redundant 35+135 setting to allow their 28mm M-Rokkor to display only the permanent 28mm frameline, while other 28mm lenses will also bring up the 90mm frame. I’m sorely tempted to acquire a proper 28+90 bayonet for mine. This is good to know. Thanks for sharing this information. I have two CLE Bodies, so yes love them, I use the Voigtlander 40mm f1.4 and other of the smaller Voigtlander lenses, they all work really well with the CLE and although I have two Voigtlander bodies the CLEs are much nicer to use. What makes the CLE bodies nicer than the Voigtanders in your opinion? Wonder if anyone’s used the Voigtländer Nocton 1.2 on the CLE. I’m told that bigger lenses can obstruct the viewfinder? Really wanted that lens on the Bessa R3A and missed out on an R3A for auction recently. Thought the CLE might be an option?